I am so fortunate that my quilt story started when I was very little with trips to my Great Grandparents farm in the 60's. A trip to the farm meant that we would help in the barn, raid the pantry for cookies and get to stay in those old cast iron beds that squeaked, bounced, had feather pillows and covered with quilts that Great Grandma and generations of Grandma's had made. But the moment that I knew I was going to be a quilter began when I was a senior in high school. I was in the hospital and my aunt brought me what was supposed to be my graduation gift. It was a quilt. It was red with a novelty print of the alphabet. It was a gift of love, something she made and I loved it and her, and the obsession began. 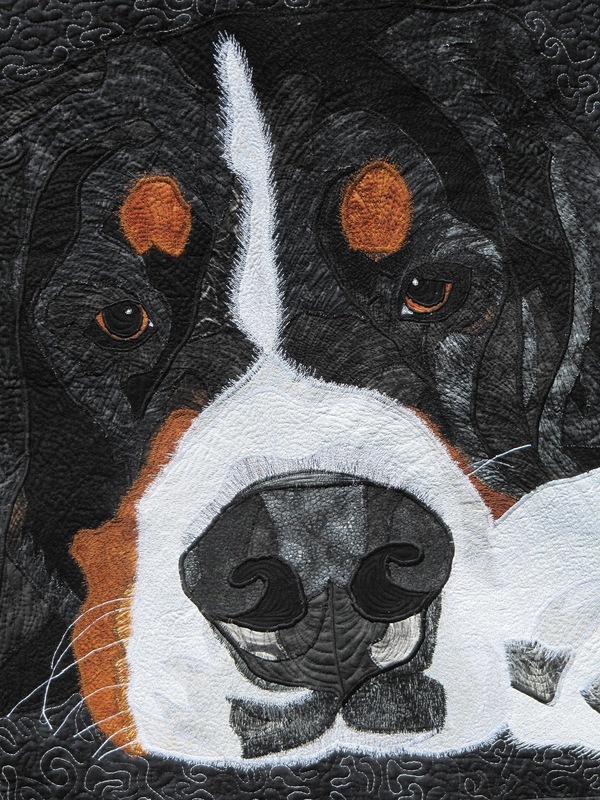 After years of sewing, eight years go I saw the pet portrait patterns of Sharon Malec and being the obsessive dog lover I am I just had to have a quilt of my dogs! So I started snapping pictures, making patterns, cutting, applique and stitching I found my love in portraits and thread painting. 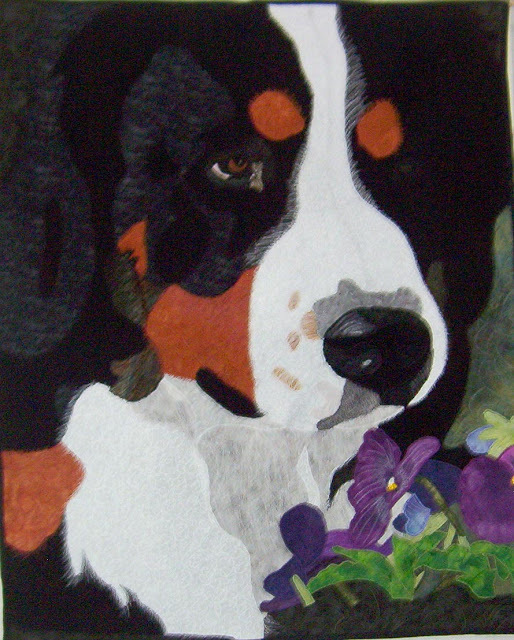 I am now teaching my portrait method at Quilters Corners in Ithaca, NY and to guilds making a custom pattern for each student of their best friend. I love to teach, making new friends and trading stories of all the silly things our furry best friends do through my portrait classes. 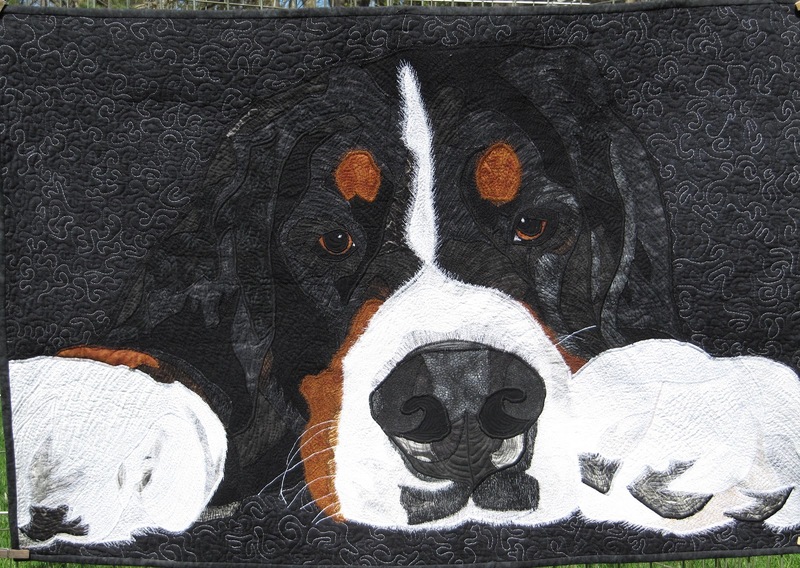 What I am most proud of are the quilts that I have donated to the Berner Garde Health Fund. Each year at the Bernese Mountain Dog Club of America National Specialty, Berner Garde has an auction of donated gifts to raise money for it's health fund. The health fund supports grants that are currently going to South Carolina State Human Genome project to study Histiocytosis which is one of the leading causes of cancer in Bernese. In the past four years I have donated a quilt each year and have helped raise $14650.00 with the highest bid this past May for my quilt of "Sebastian" for $7650.00. Those quilts are gorgeous and I loved the story of her aunt's gift when she was hospitalized. I love the story and the quilts. My son has two Berners so anything about them is close to my heart. I love dogs but Berners are so special that you can't help loving them. Beautiful quilts and the dogs are so gorgeous so how could the quilts not be beautiful! Boyfriend has a Berner and I luuurve him (photo: http://www.flickr.com/photos/wickdsmaht/7436911282/in/photostream). These quilts are phenomenal! Thank you quilt story for featuring my work!! How much fun was this! !